This entry was posted in Academic achievements, Faculty, Students and tagged award, chemical, engineering, mentor, national science foundation on June 2, 2011 by Wire Eagle. 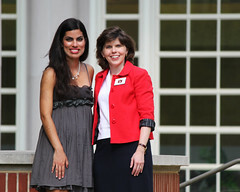 AUBURN – Auburn University faculty member Virginia Davis and recent Auburn graduate Khristine Pizarro have received the 2011 Mark A. Spencer Creative Mentorship Award. The award not only recognizes the efforts of engineering faculty who take an interest in the life and development of students through mentoring, but also rewards both faculty members and students for creative collaboration. Davis, an associate professor in the Department of Chemical Engineering in Auburn’s Samuel Ginn College of Engineering, and Pizarro, a graduate in chemical engineering, worked together as student and teacher from the time Pizarro first came to Auburn in 2007 to work in Davis’ lab. She came as part of a 10-week summer Research Experience for Undergraduates in Micro/Nano-Structured Materials, Therapeutics and Devices funded by the National Science Foundation.